You will learn how to turn off an Android smartphone / tablet by sending a simple SMS that you will put in the application. This feature is handy if you have forgotten the phone at home and want no one to pick up or handle your phone. Similarly, there are many situations where we want to shut down our Android smartphone. Note: the app we are going to use does not work if your smartphone is already root! Then install the app on your smartphone, clicking on the apk file ( RemotePowerOff-v1.2.apk included in the zip ) and choosing install. 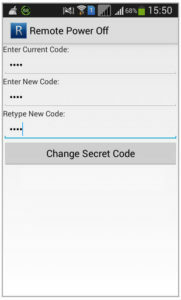 Click on " Change Secret Code ". This interface will also allow you to change your code. Your smartphone should turn off!